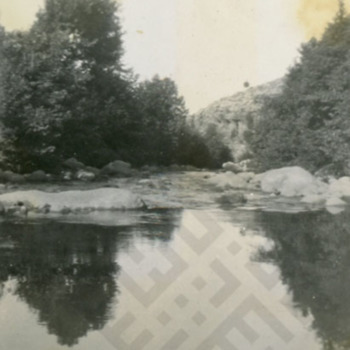 A landscape photo of a river in Lebanon. A photo of members of the Creighton family swimming in a river. The two boys are Roger and Linn Creighton. The man in the back may be Roy Lamont Creighton. A photo of a man, probably Roy Lamont Creighton, swimming in a river.